Single-atom storage; optical storage; more efficient white LEDs. Scientists at EPFL are working on a single-atom magnetic data storage device that takes advantage of quantum effects to provide dense storage. The team is using holmium, an element they’ve been exploring for years. To test the stability of the holmium magnet, the team exposed the atom to extreme conditions that normally de-magnetize single-atom magnets, such as temperature and high magnetic fields, all of which would pose risks to future storage devices. 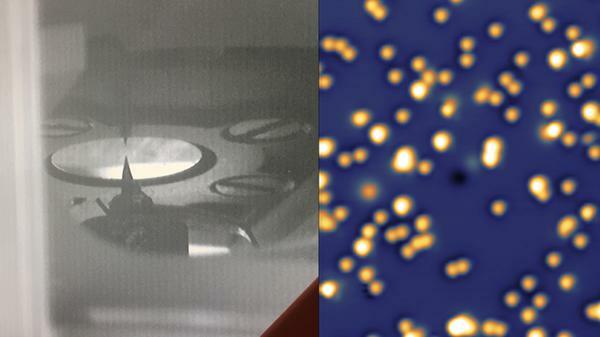 Using a Scanning Tunneling Microscope, the scientists found that the holmium atoms could retain their magnetization in a magnetic field exceeding 8 Tesla, which is around the strength of magnets used in the Large Hadron Collider. The authors describe this as “record-breaking coercivity”, a term that describes the ability of a magnet to withstand an external magnetic field without becoming demagnetized. To see how much heat it could withstand, the researchers exposed a series of holmium single-atom magnets to temperatures of up to 45 Kelvin, (-233.15 degrees Celsius), which, for single atoms, is like being in a sauna. The holmium single-atom magnets remained stable up to a temperature of 35K. Only at around 45K, the magnets began to spontaneously align themselves to the applied magnetic field. This showed that they can withstand relatively high temperature perturbations and might point to the way forward for running single-atom magnets at more commercially viable temperatures. Researchers from the University of South Australia, the University of Adelaide, and the University of New South Wales demonstrated a new, energy-efficient approach to storing data using light. The technology based on inorganic insulator nanocrystals doped with alkaline earth halide BaFCl:Sm3+, which has light-emitting properties that can be efficiently switched on and off in patterns that represent digital information. The researchers used lasers to alter the electronic states, and therefore the fluorescence properties, of the crystals. “What makes this technique for storing information using light interesting is that several bits can be stored simultaneously. And, unlike most other optical data storage techniques, the data is rewritable,” said Nick Riesen, a Research Fellow at the University of South Australia. This ‘multilevel data storage’ – storing several bits on a single crystal – opens the way for much higher storage densities, according to the team. Additionally, very low-power lasers can be used, increasing its energy efficiency and making it more practical for consumer applications. “The low energy requirement also makes this system ideal for optical data storage on integrated electronic circuits,” said Professor Hans Riesen from the University of New South Wales. Additionally, the researchers think it’s possible to create 3D data storage technologies where the nanocrystals are embedded into a glass or polymer. Researchers at Koç University in Turkey developed new white LEDs with a record luminous efficiency of 105 lumens per watt, with the potential to reach efficiencies over 200 lumens per watt. The new LEDs use commercially available blue LEDs combined with flexible lenses filled with a solution of quantum dots. Light from the blue LED causes the quantum dots to emit green and red, which combines with the blue emission to create white light. To create white light with today’s LEDs, blue and yellow light are combined by adding a yellowish phosphor-based coating to blue LEDs. Because phosphors have a broad emission range, from blue to red, it is difficult to sensitively tune the properties of the generated white light. Quantum dots, by contrast, generate pure colors because they emit only in a narrow portion of the spectrum. They also make it easier to generate warm or cool white sources by changing the concentration of the quantum dots. Typically, quantum dots for LEDs are embedded in a polymer film. However, this method, often used in LED televisions, leads to a drop in efficiency. 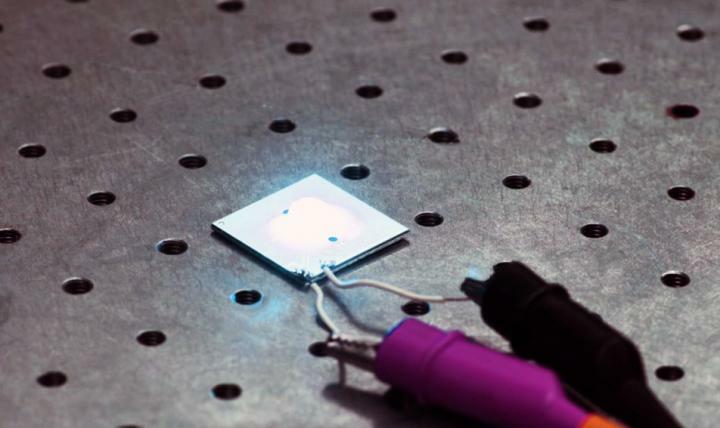 To make the new LEDs, the researchers filled the space between a polymer lens and LED chip with a solution of quantum dots that were synthesized by mixing cadmium, selenium, zinc and sulfur at high temperatures. The researchers used a type of silicone to make the lens because its elasticity allowed them to inject solutions into the lens without any solution leaking out, and the material’s transparency enabled the necessary light transmission. “Replacing conventional lighting sources with LEDs with an efficiency of 200 lumens per watt would decrease the global electricity consumed for lighting by more than half. That reduction is equal to the electricity created by 230 typical 500-megawatt coal plants and would reduce greenhouse gas emissions by 200 million tons,” said Nizamoglu. The researchers are working to increase the efficiency of the LEDs and want to reach high efficiency levels using environmentally friendly materials that are cadmium- and lead-free. They also plan to study the liquid LEDs under different conditions to ensure they are stable for long-term application.